Ingenio Cristóbal Colón, owned by the Consorcio Azucarero de Empresas Industriales (CAEI), certified its sustainability policy with the ProTerra Foundation, becoming the first mill in the country and the Caribbean to achieve this endorsement. This accreditation confirms that CAEI's management practices promote sustainable economic performance while encouraging social welfare and environmental preservation. The mill complied with the basic indicators of the norm, which included the absence of forced labor and child labor, as well as the existence of the right to organize and collective bargaining for its employees. The company complied satisfactorily with other indicators, consolidated in a culture of continuous improvement. The ProTerra certification ensures that Ingenio Cristóbal Colón has demonstrated the ability to implement, monitor and trace its agricultural production responsibly and sustainably, according to the standard, at all stages of its production chain. The independent audit was carried out from February 20-24 of this year and was executed by Cert ID Brasil, a firm that has partnered with food chain organizations in the worldwide sustainable production certifications since 1999. The executive vice president of the CAEI Consortium, Alberto Potes, described obtaining certification as a historic achievement for the Dominican sugar industry. "We are delighted and proud because this new norm is a product of the work we do to produce sugar with quality, assuming a responsible behavior as a company, and continuous improvement being the DNA that identifies us and drives us to achieve better benefits for Dominican society," said Mr. Potes. ProTerra supports organizations at every level of the agricultural value chain, providing an effective tool that makes up their certification standard, which catalyzes sustainable improvements in the performance of the production chain. ProTerra Foundation is an independent non-profit organization. The standard that certifies the companies is based on the Basel Criteria (created by the Swiss Cooperation and the World Wide Fund Foundation (WWFF), with a wide scope that takes into account the agricultural supply chain and the need of the market to have foodstuffs that differ from their competitors by having strict socio-economic norms and environmental sustainability standards. The objective of the ProTerra Foundation with regard to these standards is to promote good agricultural practices, conserve the environment and biodiversity, while creating a link between production and demand for products that do not have Genetically Engineered Organisms (GMOs). In 2016, Ingenio Cristóbal Colón became the first company of its kind in the Caribbean and in the country to receive the Bonsucro certification, for its own agricultural operations and for the processing and grinding for the production of sugar and molasses. 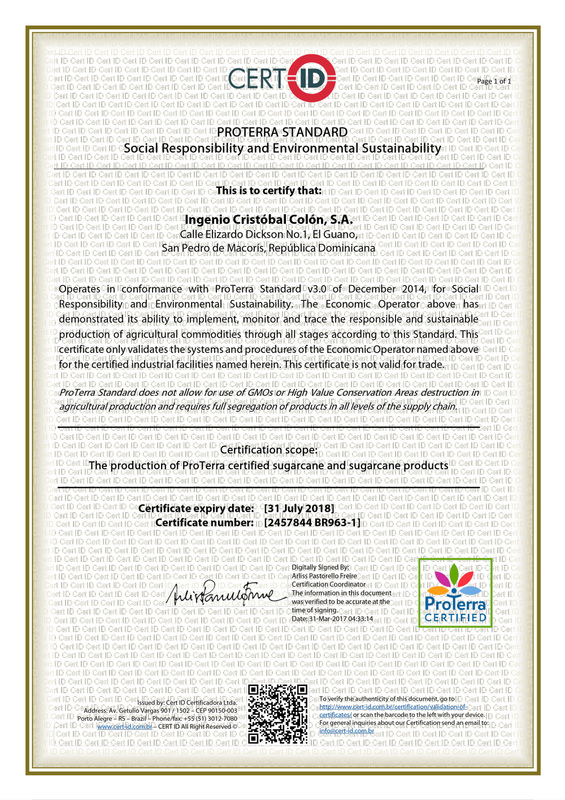 This certification, and the recently issued ProTerra certification, position Ingenio Cristóbal Colón as a model sugar and derivative company in the country and the Caribbean for adopting practices that guarantee business sustainability, societal responsibility, and preservation of the environment and biodiversity. Ingenio Cristóbal Colón is the first company in the country to receive the occupational health and safety certification OHSAS 18001: 2007 for the areas of cultivation and harvest of sugar cane. It is also the country's first mill with the ISO 9001: 2008 extended quality standard, which includes the production, milling, manufacturing, packaging, storage and marketing of cream sugar and molasses. CAEI is an asset portfolio company run by Putney Capital Management, an affiliate of INICIA.